Midfielder Jack Cork is in line to make his Clarets debut on Saturday at the club where he started his career. Cork is back at Turf Moor on a permanent basis after two previous spells on loan from Chelsea between January 2010 and May 2011. And he feels the first day of the season is as good a time as any to take on the champions as they look to reestablish themselves among the Premier League frontrunners. The 28-year-old was at Chelsea from 1998 until 2011, without making a senior appearance for the Blues, and he said: “I always look forward to it because I never really got chance to play there - I was always on loan. “It’s always one I look forward to going to the most. “The people have changed, but there are some familiar faces. “It should be exciting for us. “Maybe first day will be good for us because we’ll be fresh. 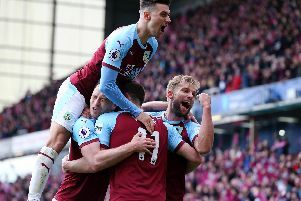 Cork had seven loan spells away from Chelsea, at Bournemouth, Scunthorpe United, Southampton, Watford – where Sean Dyche was youth team manager – Coventry City and Burnley. Chelsea have 39 players already out on loan, with the concern that many will, like Cork, never kick a ball for the club. Cork ended up plying his trade in the Premier League, however, and feels the system works: “I liked it. People said ‘don’t sign for them because you won’t play’ but that’s not necessarily the way it goes. “Look at how many players have made it after signing for them and doing well through the loan system. “You get a lot of opportunities at Championship or lower Premier League teams. It is tough but just a different way of doing things. It has worked.